Alberto Cairo in his The Functional Art book weaves visualization theory and techniques with real applications and critiques about existing visualization projects. 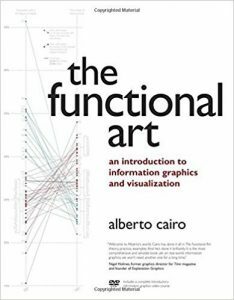 In the first part of the book, Cairo explains good graphic techniques and strategies, how to create eye-pleasing graphics and, most importantly, how to use data visualization to tell a story. The second part of the book is more about the eye-brain connection and how we as humans perceive different shapes, colors etc. Our brain has the ability to create and understand visual representations with different degrees of abstraction: graphics that encode data, concepts, connections, and geographical locations. The human brain has dozens of regions related to visual perception: densely interconnected groups of neurons devoted to the processing and filtering of information that we collect through our eyes. The brain doesn’t just process information that comes through the eyes. It also creates mental visual images that allow us to reason and plan actions that facilitate survival. The first and main goal of any graphic and visualization is to be a tool for your eyes and brain to perceive what lies beyond their natural reach. Effective analytic designs entail turning thinking principles into seeing principles. So, if the thinking task is to understand causality, the task calls for a design principle: “Show causality.” If a thinking task is to answer a question and compare it with alternatives, the design principle is: “Show comparisons.” The point is that analytical designs should be decided on how the architecture assists analytical thinking about evidence. An information graphic can explain many different things once (novelty) or it can explain the same things several times, by different means (redundancy). Striking a balance between novelty and redundancy is critical. Novelty is important to avoid boring your readers, but a certain level of redundancy is necessary if you want to be understood. The complexity of a graphic should be adapted to the nature of your average reader. This efficiency principle is defined with more precision by Tufte as the data-ink ratio: a measurement of the amount of ink that is used to represent data in a chart. Tufte defines data-ink elements as those that cannot be removed without destroying the integrity of the presentation. The other items, those that amount to decoration, can be eliminated because they are either redundant or they distract the reader from what really matters. Data-ink ratio = Ink that encodes data / Total amount of ink used to print the graphic. ⚡A data visualization should only be beautiful when beauty can promote understanding in some way without undermining it in another. Is beauty sometimes useful? Certainly. Is beauty always useful? Certainly not. -Stephen Few. The first step to finding the middle ground between radical minimalism and a more playful approach to information graphics and visualization is to remember that a good graphic realizes two basic goals: It presents information, and it allows users to explore that information. In other words, an information graphic is a tool for the designer to communicate with readers, and a tool for readers to analyze what’s being presented to them. Vision is the result of mapping your environment based on the aggregated information your eyes obtain from multiple fixations. But the eyes don’t fix on random sections of the landscape. They are attracted first to certain features before they move to others. They prioritize. Not all of what stimulates the cells in your retina is processed with the same level of detail in the brain, and not all of what the brain perceives reaches a conscious level and becomes rational understanding. ⚡In 1984, William S. Cleveland and Robert McGill, statisticians published a groundbreaking paper that proposes basic guidelines for choosing the best graphic form to encode data depending on the function of the display. The authors designed a list of 10 elementary perceptual tasks, each one a method to represent data, and ranked them according to how accurately the human brain can detect differences and make comparisons between them. You need to build a solid backbone for your information, a reading path, an order, and a hierarchy before you lock yourself into a style for your display. The structure is the skeleton and muscles of your graphic; the visual style is the skin. With no bones to support it, the skin of your project will collapse. You should not proceed to develop a graphic on the computer before you’ve devised a precise outline of the graphic’s elements and how they relate to one other. Planning your content in advance saves a lot of time down the road. First, present the most important figures or the most relevant points. Then, allow readers to dig into the information, explore, and come up with their own stories. Some of your infographics will necessarily be linear; that is, each step of the presentation will depend on understanding the previous one. Other graphics will be non-linear, giving readers choices for navigating the information using buttons, scrollbars, and other means. In either case, you would introduce the topic using a clear headline and a short intro. Don’t throw tons of data at readers if you don’t explain first what it means. When Connie Malamed asked Alberto what he wanted readers to take away from this book. He said that he has a double goal.